I forgot to post this photo when I took it in the early fall. So, where am I? Remember many moons ago we discussed the twisted and tawdry tale of now former Tredyffrin Zoning Board member Suzanne Pratowski and her arrest, magical court date, and former friends with benefits Tredyffrin Supervisor John P. DiBuonaventuro ? Well while that was all going on, apparently she also had her ex husband Jay Ciccarone in court over purported internet spying. Now maybe this guy can get on with his life in peace? 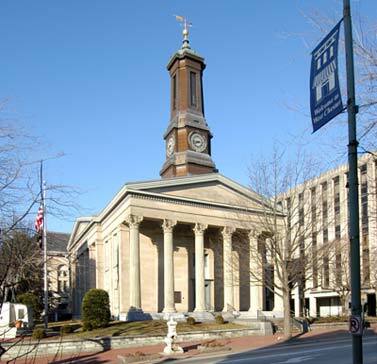 I learned in a telephone call today from Jay Ciccarone that President Judge James MacElree, Court of Common Pleas of Chester County has dismissed his case. 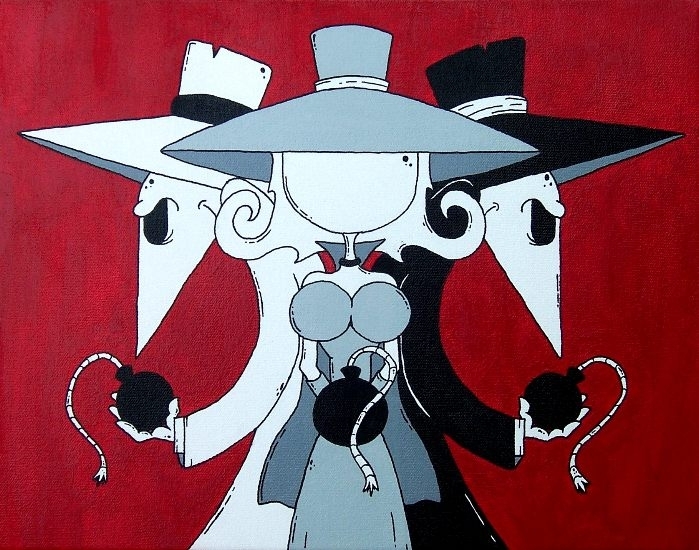 If you recall, Ciccarone’s former wife, Suzy Pratowski, accused Ciccarone of cyber spying. Ciccarone was arrrested in September 2011 and charged with spying on Prawtoski. 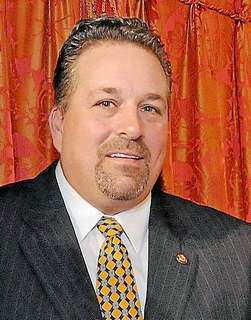 At the time of Ciccarone’s arrest, Tredyffrin supervisor John DiBuonaventuro was dating Pratowski. My family and I are glad and relieved that Judge MacElree has dismissed the case that has been pending against me for more than 16 months. The arrest, charges and publicity has been a great burden on me personally and professionally and I am looking forward to moving past this ordeal. I only hope that the dismissal of these charges receives as much attention as my arrest did. Jay had maintained his innocence throughout this ordeal … today there is vindication. In November when I first saw the ads on Craigs List and wrote about them, I had no idea we’d be talking about it now months later. Shall we review a couple screen shots of these ads again first ? And wow people, this is my blog. When a person enters comments on a blog for the purpose of public display, he/she can be construed giving an implied license at least for that display and the incidental copying that goes along with it. So, if you don’t want everything published, don’t comment. If you don’t want everything published, don’t write threatening comments. If you don’t want to be known you are commenting…don’t comment. But you can’t expect to write in and think we are just going to be pen pals. When people deal fairly, I have no issue. But I will not tolerate threats or bull twaddle. I did not go looking for all this stuff about horse rescue, it was stumbled upon. I have no interest in horse ownership or riding at this point. 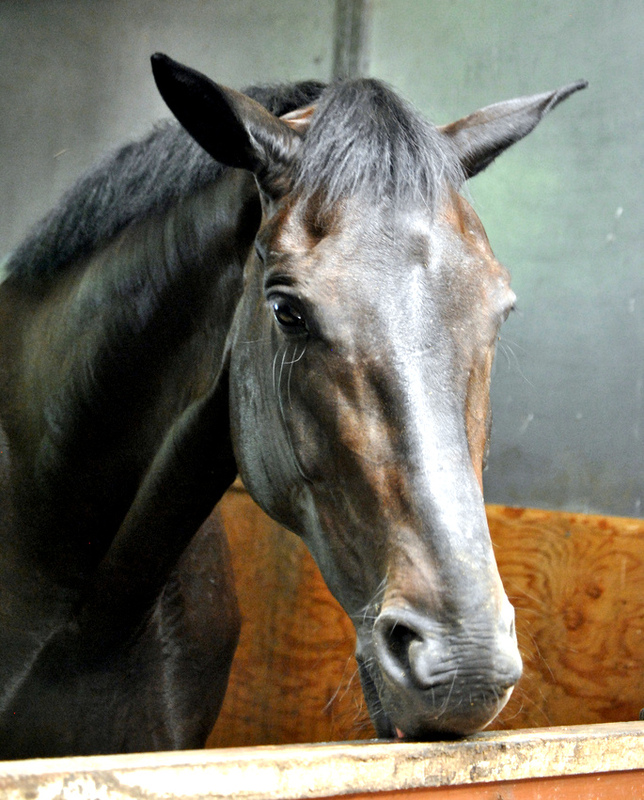 I just happen to like horses and admire those who care for them well. I also know a thing or two about how legitimate rescues work. I have people commenting left and right so how can there not be something wrong? If this was a giant non issue would everyone be talking about it? You know what I want? For this issue to be put to bed. I know traditional media and others are looking at this, so it is only a matter of time until it all comes out. I want Barbara Luna and Turning For Home and Parx Racing to stand up and explain how they are caring for horses and to show that every horse that leaves the track for any rescue is o.k. After all, what legitimate animal rescue doesn’t have copious records? She gets paid to do a job, so this should be no big deal, right? I so wanted to give Jessica Basciano and Off The Track Thoroughbred Rescue the benefit of the doubt, and can it be said part of me still hopes she can explain it all? I still believe she got into rescue for the right reasons, but is she now in over her head? And if she is in over her head, isn’t it o.k. to say so and call in other horse rescues to help her out? And why can’t she open up to the public on the horses she has rescued? Where did they all go? Do they have all their paperwork and records? Are they all safe and cared for? Did she check references on those adopting horses? Were home visits conducted to see if the horses were doing o.k. after moving through the rescue? Is there paperwork for a non-profit? Is there incorporation of this rescue as a straight up business? How does this rescue train their volunteers and prospective adoptive families? How many rescue horses leave her organization and cross state lines? How are out of state adoptive families vetted? Are there special rules for shipping animals like horses across state lines? Animal rescue is serious business, and the larger the animal the more expensive and often all the more serious. If horse rescue were all so hunky dory, people like that Deborah Jones I have read about would have nothing to do but sit home and eat bon-bons. But as the weeks go on, there are no answers out of either of these rescues. But people are getting harassed and threatened for asking questions aren’t they? And that would be on the blogs, bulletin boards and in real time, isn’t that correct? NATCHITOCHES — Dozens of emaciated horses are in the care of the Louisiana Horse Rescue Association after being surrendered by the owner of a Natchitoches Parish horse breeding farm. For two, the rescue was too late as they died at the organization’s quarantine facility shortly after arrival. Others are in such poor shape their survival is questionable, according to Sunny Francois, volunteer director of the Louisiana Horse Rescue Association. Could more have been done to prevent the deaths of those horses and perhaps dozens more evident from skeletal remains and shallow graves on the grounds of Ryder River Ridge Farms? That’s the question of rescuers who have bombarded local, parish and state agencies in recent days with complaints about the horses’ condition and lack of enforcement action…..The day before is when photographic evidence was provided to investigators by Donna Keene, owner of Remember Me Rescue in Burleson, Texas. Keene rented a helicopter and flew over the Ryder property to document emaciated horses standing in the pastures, along with scores of intact and scattered horse skeletons. The ground was marked with what appeared to be shallow graves, some of which had skeletal remains partially exposed through the dirt. If these two horse rescues, Turning for Home and Off The Track Throughbred Rescue are on the up and up and every horse can be accounted for with all proper paperwork, all those coggins things, medical records and so on and so forth, why do people keep complaining out there? Is it really a giant conspiracy theory come to life and attack of the zombie mean girls or is it where there is smoke there is fire? I have to ask is there so much drama surrounding ferret and cow rescue? And oh yeah who is confusing this whole drama with the coziness of who do you know in Caernarvon Township? File under ToTo you’re not in Kansas anymore or on the board of auditors whatever that is? Once upon a time in a land now far, far away my father’s friend Bill showed up for a visit with a giant bottle of wine – a Jeroboam of some very fine Chianti Classico. 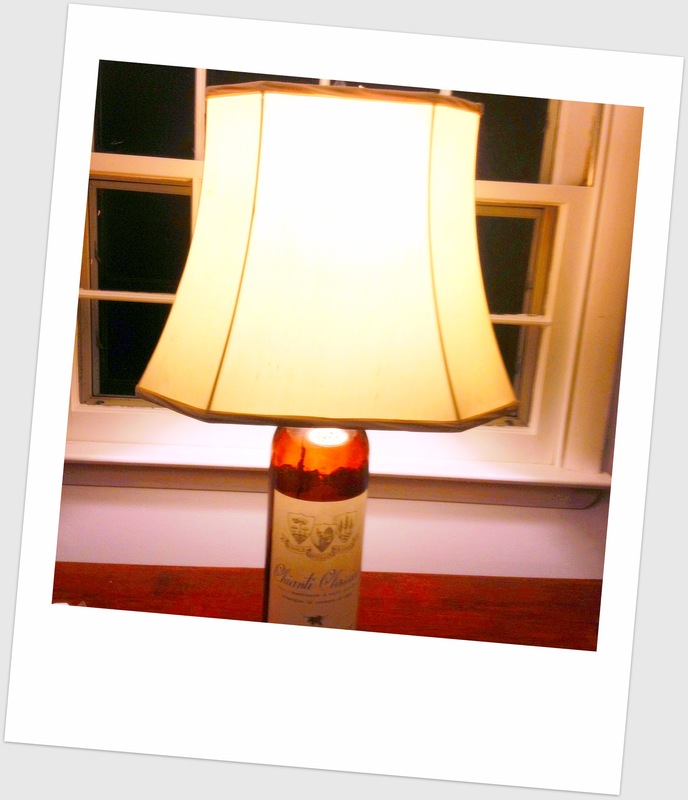 My father made the bottle into a lamp after the bottle was emptied at a dinner party. The lamp came to me, and the lampshade on it currently kind of went kaput. (Silk lampshades do that after a while.) So we just ordered the bottle a new shade! I love this lamp because it is very cool and also because it has some very happy childhood memories attached to it. Not that I was drinking the wine at that time but it was just because of all the times when we were growing up that we got together with my father’s friend and his family. And when people ask how I come to put things in my house or say I have such tremendous decorating skills, honestly it isn’t the skill part as much as filling my home with things I love, that bring me pleasure, evoke happy memories. Stuff that I just like, want to look at, want to use. To me that is where so many people go wrong when decorating their homes. They see a photo in a magazine, or see a trend. But they don’t interpret what they like on their own, more often that not they bring in some sort of decorator. Mind you I have no problems with a decorator providing you with the bones of a room if you are stuck, but face it you know yourself, so play an active role. Unless you like living in a Trendy Wendy or beige, beige world? What I bring into my home for the most part most of the time did not cost me a lot. Long before Martha Stewart rolled up or Rachel Ashwell and her shabby chic self was popular, I was combing flea markets, thrift stores, consignment stores, garage sales and the like for things to define my living spaces. I needed to develop my own style, and I needed to be able to afford to do it. To this day I would rather pick something up second-hand and not necessarily officially antique than to buy new. My thrown together escaping one category of style is not so unusual, I see it with my friends. For example, my friend Stevie and her husband not too many years after they were married needed some storage pieces. Stevie thought outside the box and she bought of all things an old chicken coop. She restored it and adapted it to modern use and it is hands down to this day still one of my favorite pieces. Another favorite piece belonging to someone else is this dry sink that a friend of a friend has. 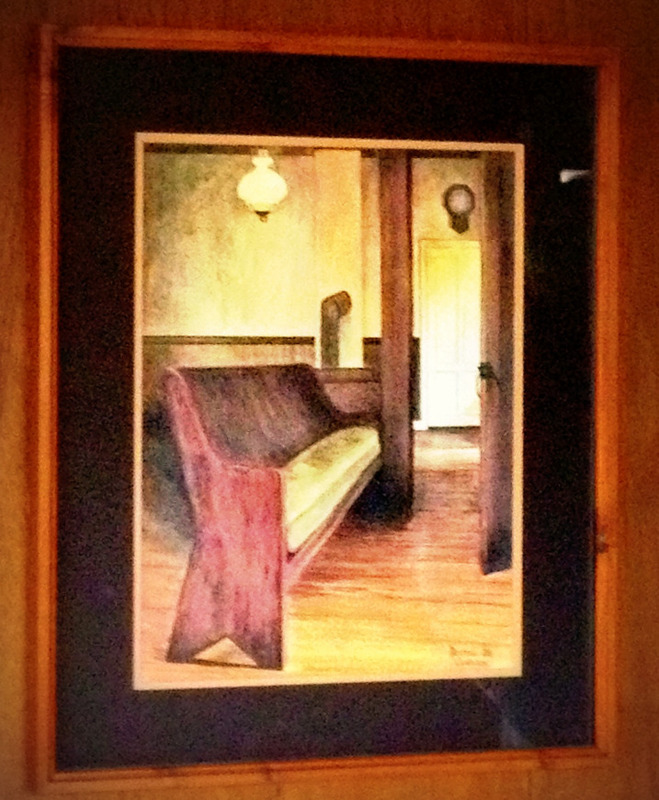 Obviously rescued from a barn or a similar structure, it was cleaned up and put into this one woman’s living room. It is so awesome. 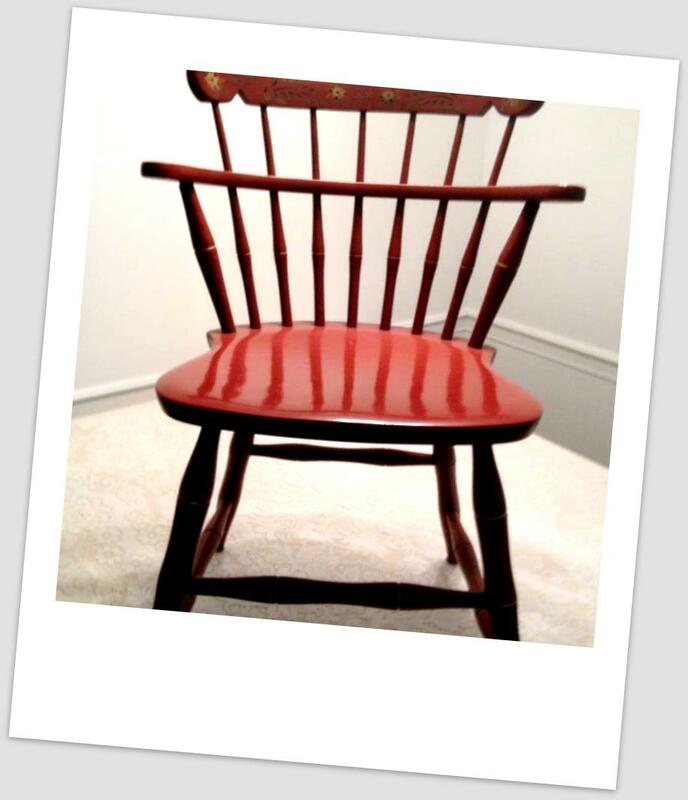 With the exception of four bent wood chairs from Bent Brothers in Gardner Massachusetts, which are now my kitchen chairs thanks to that Resellers consignment Gallery in Frazer, I don’t do much painted furniture. I like looking at wood and I am sick to death of going to flea markets and antiques and collectible markets and seeing everything coated in some shade of white or pastel. Now my Bent Brothers chairs which have the brand logo burnt in the bottom of the chairs along with the paper tags still on the bottom won’t ever light the antique world on fire. They date back probably to the late 1940s maybe the 1950s, but they are crazy sturdy and well made…and appealing to the eye in their original paint and stenciling. I love them. And they cost next to nothing – which they should because Bent Brothers (which operated between 1867 and 2000 in Gardner MA) although they produced durable pieces of furniture, if you do the research they do not retain their value. Another trend I am sick of is coating everything with blackboard or chalkboard paint. Lordy people, WHY??? Got a school marm disease or something??? Something else I love? Patchwork Quilts. I love old quilts. But I use them. So I buy them inexpensively – church sales, flea markets, barn picking, Ebay. They are a great way to add color to the room and there is nothing more homey than curling up under a ptachwork with a good book or a movie on a cold winter’s night. The take away here is simple: enjoy where you live and remember your spaces are meant to be lived in. Buy what gives you pleasure, don’t necessarily buy in the category of “dress to impress.” Also remember cutsie doesn’t age well in decorating, either. And remember, don’t be afraid to bargain shop and barn pick. You never know what you might find! 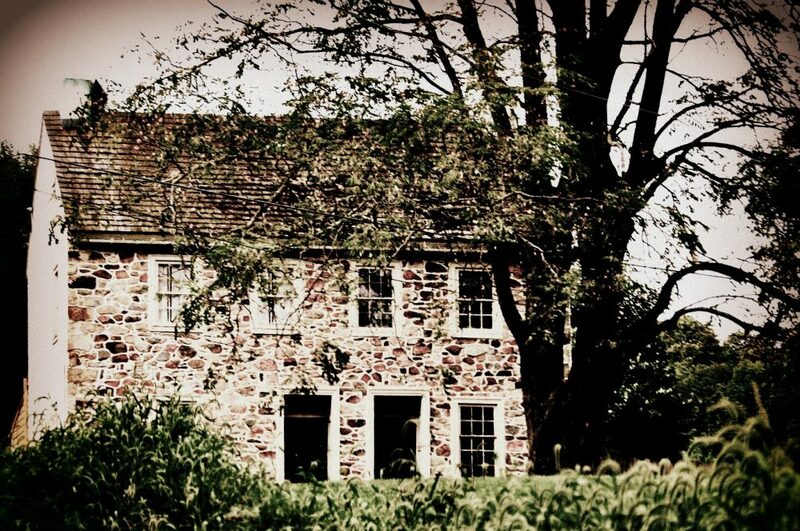 In Easttown Township on Waterloo Road there is a barn called the Kennedy Barn by some, Mrs. Rossi’s Barn by others. Mrs. Rossi’s husband was the one who restored the barn most recently, apparently. He was a co-founder of ANRO printing. So in a nutshell, this barn isn’t past salvation like many large and now unused barns. The barn is described by the Inquirer today as “hundreds of years old.” Yet Tom Bentley of Bentley Homes can’t seem to do a thing with it, can’t seem to market it well enough to sell it. He wants to demolish it. You see the barn is standing between him and eight or so new McMansions. Yes, some consider Bentley a better kind of developer. I just see his homes as more upscale stone facing, stylistically over complicated and contradictory on the exteriors, yet still at their heart big Tyvec boxes on relatively small lots for the most part for their size. For the most part all they do is scream “NEW”. I first became aware of Bentley years ago when working on a wine tasting for a Philadelphia Orchestra Committee. Like many developers are wont to do, he lent one of his sample homes for the tasting. I think it was over near Aronomink Golf Club. The house was a large, drafty cavernous box with all the bells and whistles the nouveau riche of the Main Line would shrivel up and die without including a kitchen that you knew would be for show in the end rather than actual use. It kind of went with his girlfriend at the time, a woman who looked like a rather less expensive version of Stevie Nicks. I was disappointed when I moved out to Chester County when I realized one of my favorite streets in Malvern, Forest Lane, had sprouted a veritable infantry of Bentley Homes. All but one is predictable and went up in about ten minutes. So over there, the horse is out of the proverbial barn, nothing can be done. But over in Easttown? What the heck is wrong with their supervisors and planning commission? Where is their historic commission on this? Let’s get real: if Bentley wanted to save the barn, he would. If he wanted to use the barn he would, because earlier developments of his sometimes included older structures, original to the property. But nooooo, Bentley wanted to knock down the barn and leave some man-made ruin with a freaking plaque! “Barn Wuz Here”. How fabulous and generous. Not. And those on this commission in Easttown including a woman I think highly of for prior preservation and community building efforts think this is o.k.? I think I am the most disappointed in her. And yes, I get how this all works and they are trying to make the best of a bad situation, but you know what? Not good enough. Bentley is a well-heeled developer. If he wanted to, he could turn that barn into a living space adapted for modern use. It is done all over the country, and has been done successfully on the Main Line and out here in Chester County as well. Facing Forest Lane in Malvern on a corner of another development street just up from Bentley’s homes on Forest sits an amazing example of a barn converted to living space. Friends of my family live in another such space on Upper Gulph Road in Radnor Township and there is also another converted barn space on Darby-Paoli Road that once belonged to a family I knew in high school and then to another a woman my mother used to know. 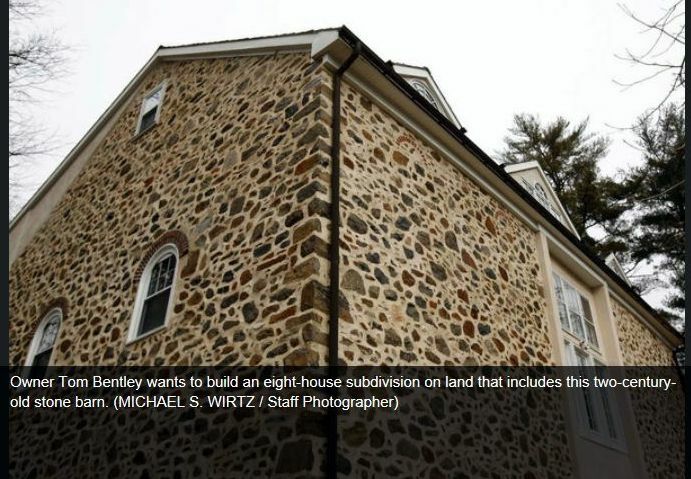 And circling back to Bentley, those houses he is building on County Line Road in Villanova? It is amazing how many trees did not survive, isn’t it? The point is, it can be done (the barn saved and turned into some sort of adaptive reuse, preferably residential), only Bentley doesn’t care and Easttown is willing to settle at the expense of its irreplaceable history. Not that Easttown is the only municipality guilty of these travesties. As a bit if a related segue, I believe it is on one part or near Sugartown Road if you go the back way to hit that Buho Mexican restaurant in Exton you see a neat row of some houses that were quite lovely at one time which are now rotting. Obviously some developer bought them and got hit by the economy tanking. It makes you shake your head in wonder. Every one of those houses could have been upgraded to more modern means if need be, but no, someday they will all come tumbling down for some more plastic boxes. Chester County municipalities need to collectively wake up before everything is ruined out here. Once the land is gone, it’s gone. Once the old buildings and historic structures are gone, they are gone. I know every old house and every old building can’t be saved, but lordy at least make an effort once in a while. And that is the problem: none of these municipalities make a consistent effort any longer. If any of you out there know anyone that can wrest this barn from Bentley or get him to save it on his own, please do. Personally when I hear things like this I think next time there is an election Easttown residents should change-up the faces don’t you? It is time that deep pocketed developers stop running and ruining communities, isn’t it? But if you see Tom Bentley cruising your neighborhood you can’t miss him. He has a preposterous vanity plate. For two centuries, give or take a few years, an enormous stone barn has occupied a patch of land now at the end of a winding Main Line driveway on Waterloo Road in Easttown Township. In the township’s historic archives, it is known as the Kennedy Barn. For residents in the area, it’s Mrs. Rossi’s barn; for years, it was part of the estate of Rose Rossi, one of the cofounders of ANRO Inc., a printing company. But lately, it has been the central figure in the Battle of the Barn, pitting longtime Main Line residents against a builder of some of the region’s largest and most luxurious residences. The 10-acre parcel on which the barn sits is owned by Tom Bentley, chief executive officer of Bentley Homes. Bentley wants to build an eight-house subdivision on the Rossi estate and has contended the barn is unmarketable. Leaving it intact and building a house on the same lot would violate zoning ordinances. He has offered instead to demolish most of the barn, leave its ruins on the site, and erect a plaque on Waterloo Road explaining its historical significance. On Tuesday night, the Easttown Township Board of Supervisors granted Bentley a demolition permit and permission to begin building his subdivision, with several caveats: He must take 120 days to market the barn, and if he sells it, he must redraw lot lines in the subdivision to comply with zoning ordinances….Locals have cried foul…. 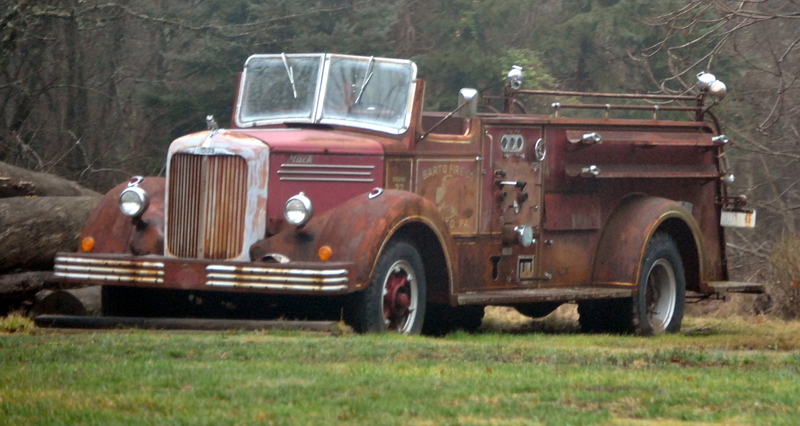 Kemp Littlepage, who lives across the street from the barn, offered to buy it from Bentley on the spot Tuesday night. “I wouldn’t sell it to you anyway,” Bentley said. 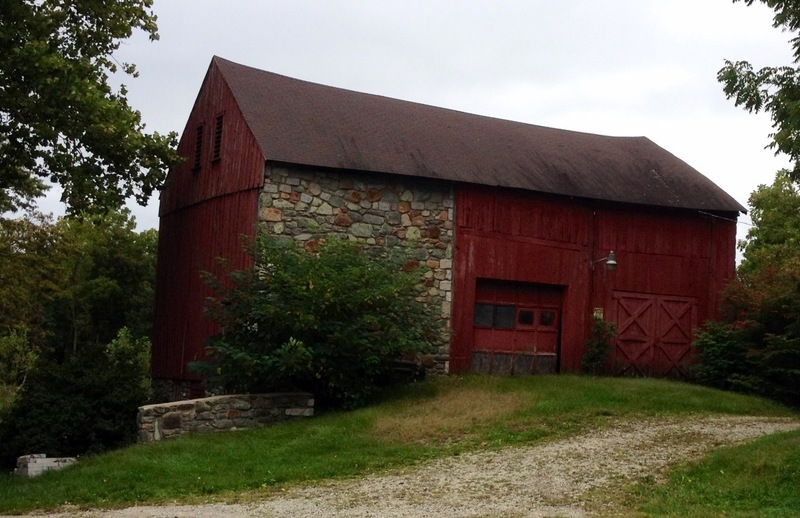 The reducing-to-ruin of a refurbished early-1800s barn in Devon is one step closer following Wednesday’s Easttown Planning Commission meeting. The commission agreed to recommend approval of Bentley Homes’ application for demolition to the Easttown Board of Supervisors, with consideration given to requests from the township’s Historical Commission. For months, the Planning Commission has heard from those who hoped to save the barn on the former property of Angelo and Rose Rossi at 222 Waterloo Road, which Bentley CEO Tom Bentley wants to turn into a 10-acre subdivision.